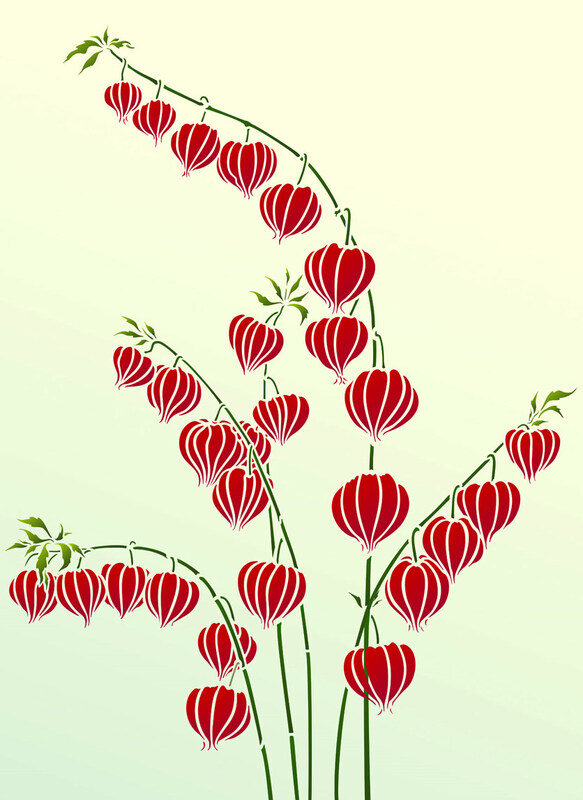 The Chinese Lantern Stencil – is a designer theme pack stencil based on Henny’s striking drawings of the papery lantern-like flowers of the Physalis plant, known as the Chinese Lantern. 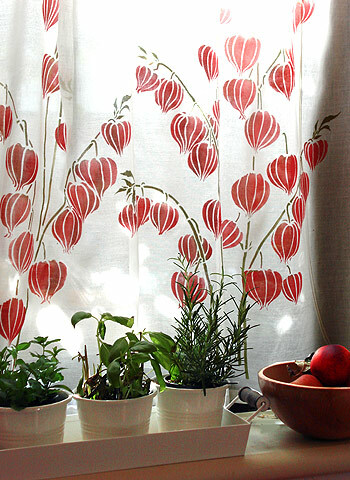 Ideal for designers and decorators passionate about carefully observed botanical motifs. The different motifs of this theme pack stencil are perfect for creating striking wall features and modern botanical fabrics. Easy to use theme pack stencil on two large sheets with 4 Chinese Lantern stems with additional lantern, leaf and stalk motifs for extending the design as required. See size specifications below. 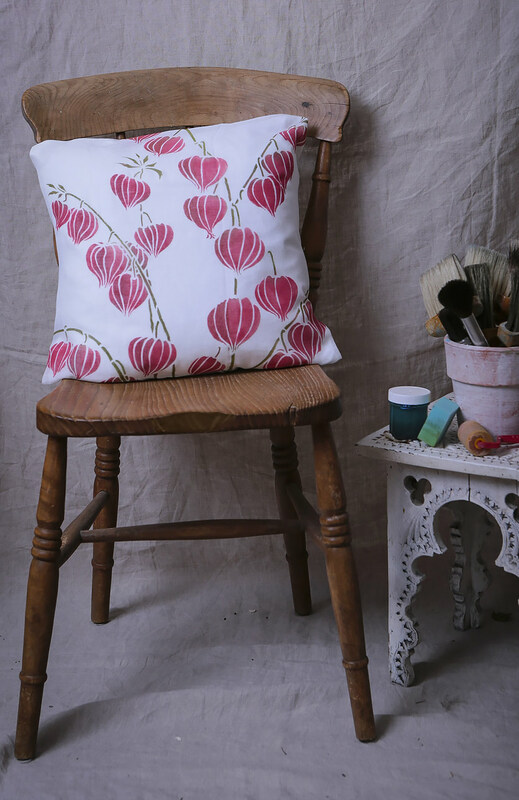 Above and top – the different motifs of the Chinese Lantern Theme Pack stencilled in our Fabric Paints on a cotton voile covered cushion. 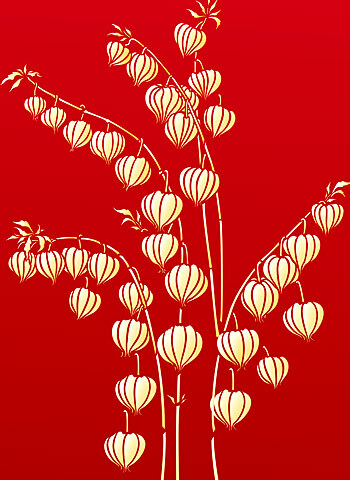 Above – the different motifs of the Chinese Lantern Stencil clustered together. Shown here in Seville Orange , Very Berry, and Woodland and Verbena Stencil Paints. 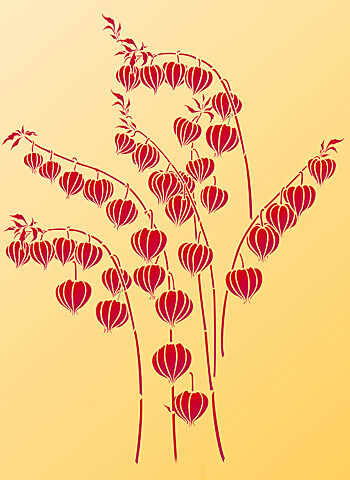 Above – the different motifs of the Chinese Lantern Stencil arranged in a clustered grouping, with additional lantern, stalk and leaf motifs. This stencil works perfectly in gold on red – shown here in Yellow Ochre and Vanilla Stencil Paints on a rich red background. 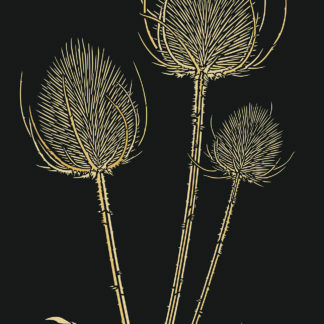 Above – the different motifs of the Chinese Lantern Stencil moved around to show an alternative clustered grouping, stencilled as a red silhouette in Very Berry and Raspberry Stencil Paint on a rich yellow background – use this technique on gold paint, such as our Antique Gold Metallic Stencil Paint for a sumptuous finish. 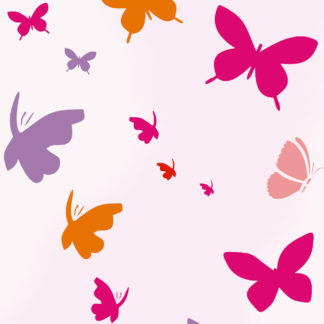 Also see the Little Chinese Lantern Stencil and Large Chinese Lantern Stencil. 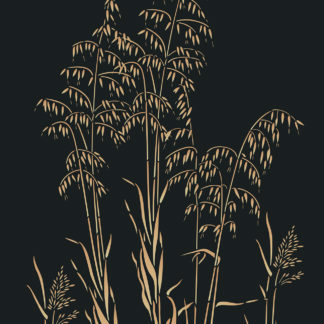 Above – the motifs of the Chinese Lantern Stencil are combined with our Wild Slender Oat Grass Stencil and Wild Meadow Grass Stencil. 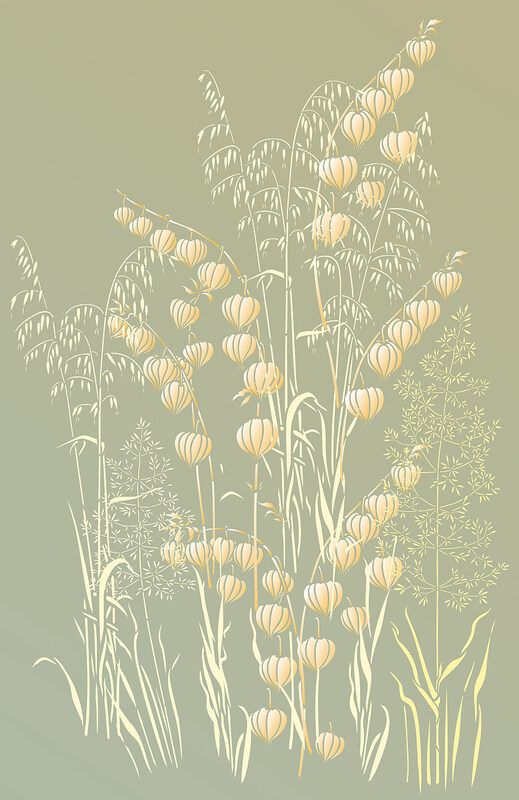 Shown in subtle tones Vanilla, Evening primrose and Yellow Ochre Stencil Paints on a muted sandy-beige background. 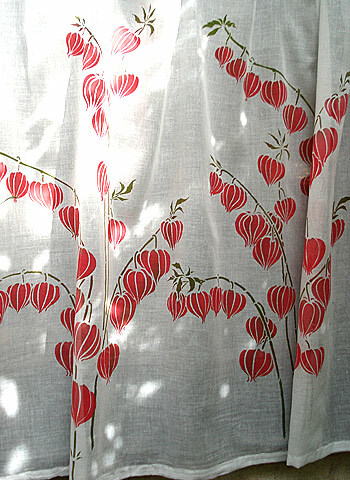 Above – the different motifs of the Chinese Lantern Stencil stencilled onto a light, airy voile curtain, perfect for this kitchen window. 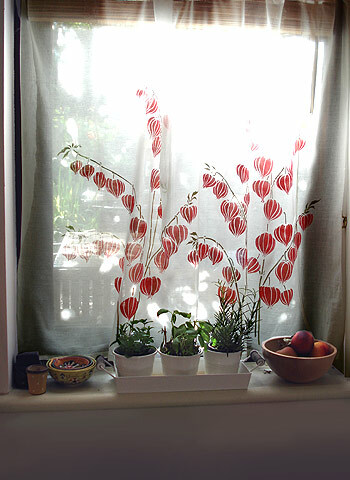 Stencilled in Strawberry Red mixed with Sunny Yellow (lanterns) and Leaf Green (stems and stalks) Fabric Paint. Above – stencilling the Chinese Lantern Stencil onto voile gives a beautiful effect – creating a stunning focal point for the room whilst letting light flood into the room. Motif Fabric Paints, once ironed with a hot iron, have a high standard of colour fastness withstanding light and repeated washing very well. 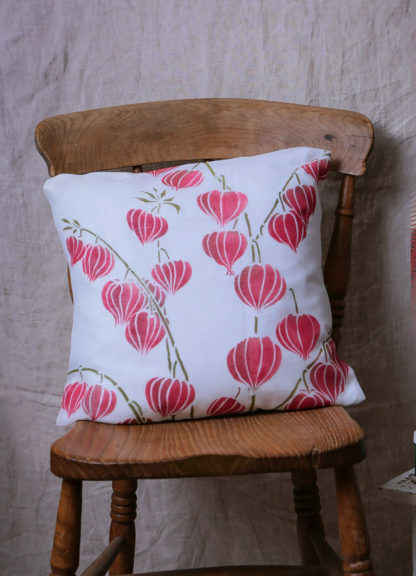 If you haven’t tried stencilling onto fabric yet give it a go! 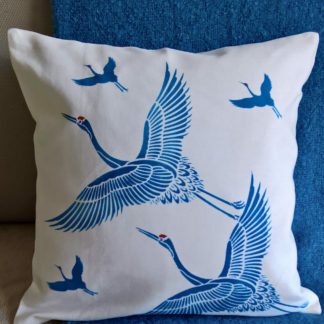 The high absorbency of fabric makes good quality stencilling easy and it is a great way to ring the changes across the home. 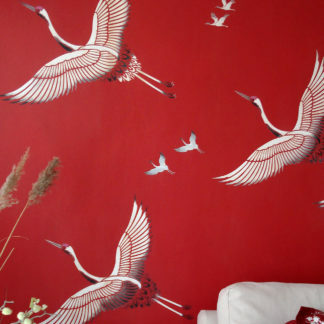 Using a good quality paint such as Motif Fabric Paint will ensure good results. 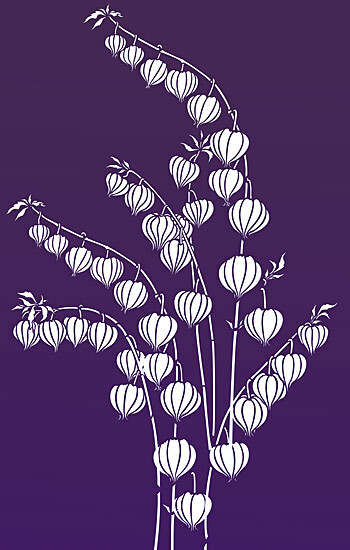 Above – the different motifs of the Chinese Lantern Stencil arranged in a tapered grouping, silhouette style in Ice White Stencil Paint on a rich purple background. 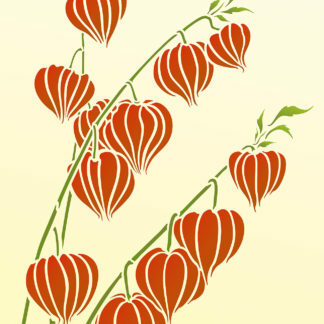 Above – the different motifs of the Chinese Lantern Stencil, shown here in Very Berry, Raspberry (lanterns) and Verbena and Woodland (stalks and leaves) on a pale aqua-apricot background. 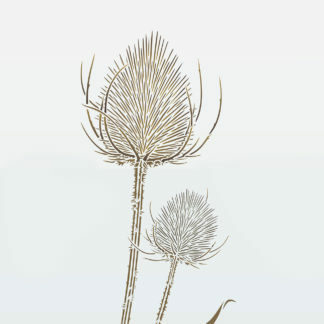 Shown with additional lantern, leaf and stalk extensions. 4 one layer stencil motifs on two sheets of 125 micron Mylar. 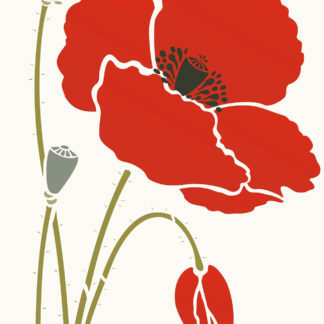 Comes with lantern, leaf and additional stalk motifs for adding to the design. 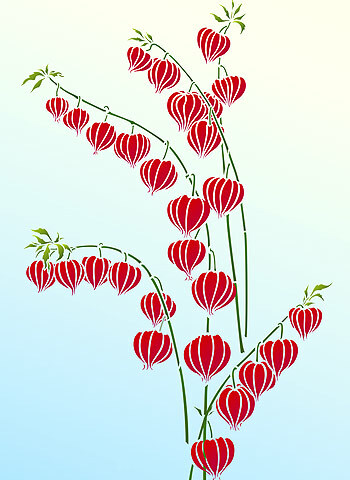 Tallest lantern motif is 73cm/28.75″ tall x 32cm/12.5″ wide (left sheet below). Smallest lantern motif is up to 24.5cm/9.75″ wide by 31cm/12.25″ tall. Lanterns up to 6cm/2.5″ wide x 9.5cm/3.75″ wide. Sheet size 41cm/16″ wide x 80cm/31.5″ high. 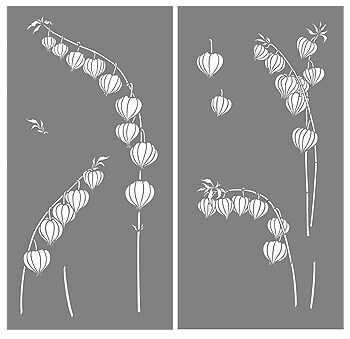 Left – shows the layout of the two sheets of the Chinese Lantern Stencil, with additional lanterns, leaves and stalk motifs for extending the design.